Ian Chadwick is a freelance technical writer and editor who specializes in desktop publishing and word processing, and is a columnist for ST-Log. Thom Weeks is an architect for the firm of Zeidler Roberts Partnership, Toronto, Canada. He and his architect wife, Jennifer, both use AutoCAD in the office and DynaCADD at home. They bought their Mega ST specifically for CAD and paint programs. Our thanks to ISD's Nathan Potechin and David Fletcher for their time and efforts and the hours spent in patient demonstration and answering questions. DynaCADD is one of a rare breed of software. 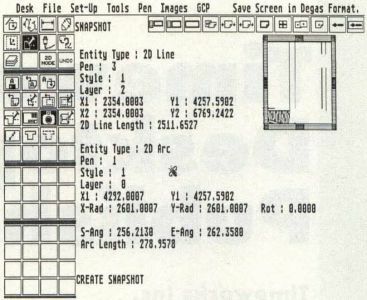 It is designed and implemented uniquely for the Atari ST, for the professional user. It isn't a cross-breed or a port from another system, with features and commands sorely limited to suit the impression that the ST market isn't a serious place to develop in. It is easily the most complex, fully featured program available in its category. In fact, its real competition doesn't even come from within the ST market, but from AutoCAD, the best-selling PC/MS-DOS program. At $695, DynaCADD is also in the stratosphere of ST pricing. The price alone should be a warning to casual users. And if that doesn't deter you, the almost-bewildering array of commands and features should convince you. DynaCADD is meant for the professional market: engineers, architects, designers, draftsmen. It makes no concessions for amateurs, tinkerers or hackers. DynaCADD is both a two- and a three-dimensional CAD package. In 2-D mode, it supports up to 256 layers. The screen can be subdivided into four windows, each of which can be used to display a different "view." Views can be rotated, moved or zoomed independent of one another. The user interface follows all of the familiar GEM conventions, including windows, scroll bars and the mouse. It makes good use of the ST keyboard for Help and Undo features, although the latter is only good for the last action and does not permit backward stepping. Basically, the user interface is quite straightforward, though it takes some getting used to, since the screen is visually very "busy." Due to the complexity of the program, the typical GEM menu tree isn't large enough to contain all of the commands and subcommands. Only global commands and utilities are available through the pull-down menus. Most of the commands are displayed as icons on the "menu pads" along the left of the screen. These pads can be hidden to show the drawing screen at full size, if desired. The pads work in a tree hierarchy. That is, when you click on one, it changes the display of the lower pad(s) to show appropriate subcommands. The top pad doesn't change. There are also several unchanging icons along the top of the drawing screen. While the icon approach makes the user interface easy, it can also lead to great confusion as you try to remember what the pictures stand for. 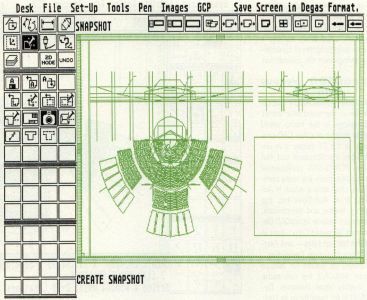 To counter this, as you pass the pointer over any icon, the text version of the command is echoed in the top left corner, above the drawing area. Finally, for those who prefer, commands can be typed in. The command line interpreter not only accepts input, but records the program's messages and the X/Y/Z coordinates of the cursor (in the units of the drawing). The text screen can be viewed anytime, or input can be echoed to the printer or a disk file. Going from one level of the interface to another is sometimes time-consuming, especially when you're deep within one part of the tree and want to back go to another branch. It requires backing up, then going forward several steps to the right command. This process can be avoided by typing the commands directly. Another part of the user interface is a scientific calculator. This always appears whenever DynaCADD expects a numeric value. Numbers can be entered and manipulated as on any calculator, or stored in four calculator memories. This seems like over-doing things when a simple numeric entry is required. It would be better to offer a two-step process: a box for simple entries, and the calculator called up by the user only when the user desires it. It would be easy to simply list DynaCADD's features, but that would consume the rest of this article. The program simply has more features than any of its competitors: 360 commands at the last count. For the professional, it does everything you need, plus a lot more. Text is treated as an entity, much the same as the other "primitives": point, line, circle, arc, fillet (an arc placed between two lines), polygon, bezier curves, ellipse and ellipse arc, except for the special commands required to deal with it. It can be moved, rotated, scaled (along either or both axes), slanted, centered and placed by relative or exact location. Individual letter spacing can be adjusted or the text set as proportional. DynaCADD does have a very sophisticated font editor (we were only able to see the developmental version for this review), but it requires you to build a font much in the same way as you build a 2-D drawing, a somewhat laborious method but rewarding in the end results. Because DynaCADD fonts are stored as vectors, bit-mapped fonts such as those used in GDOS or output by programs like Fontz, are not compatible. The other file format available, DynaCADD's own, is called DEF. This is a text (ASCII) file that can be read and edited by most word processors. The file format is described in the manual but best understood by creating and saving a drawing, then examining the DEF file. Dimensioning allows numerous formats and parameters for both 2-D and 3-D drawings, including arrowhead types, tolerances, precision and text format dimensions. You can also determine real-world scaling, such as making an inch in your drawing equal to eight feet, for exact measurements and scaling. You can measure distances between points, including the radius and diameter of circles, angles and distances between lines and points. Transformation covers a wide range of commands to manipulate entities, including delete, divide (break an entity into two or more separate entities), copy, rotate, mirror, modify, move, stretch, scale, project (extrude a 2-D entity along the Z axis), revolve (3-D only), sweep (generate entities along the Z axis), move and copy along an axis, mask, trim an entity, and transform 3-D entities into 2-D. Entities can also be grouped as figures or formats and saved to disk. Drawings can be done with a grid (visible or not) and points snapped to it. You cannot, however, add cross-hatching or other GEM fill patterns to a drawing. Views can be manipulated in a number of ways, changing not only the view location, but the distance from the entities being viewed. You can zoom or rotate a view, scroll it or hide selected entities within it. The dynamic rotation option is particularly easy to use although it unfortunately does not use the cursor (arrow) keys. A view can be stored as an image and recalled later, rather than having to work through various commands to achieve that view. DynaCADD is copy protected, using a cartridge slot key. This is simple and effective, but limits the program to single-system use. There is no provision currently for site licensing or the purchase of multiple keys. DynaCADD is one of a rare breed of software. It is designed and implemented uniquely for the Atari ST, for the professional user. For the small architectural firm or the professional who wants to work at home, DynaCADD provides a superb opportunity to get a master-level program at considerable savings over the competition. Although DynaCADD's ancestors are in the mainframe world, it competes in the micro world against dozens of other CAD programs. In the ST galaxy, it is unrivalled as a professional tool. But in the PC/MS-DOS professional marketplace, there are many competitors, chief among which is AutoCAD, from AutoDesk Inc, the industry leader and benchmark. Contenders include VersaCAD Design from Versacad Corp.—first in features but not sales—and FastCAD from Evolution Computing. Stacked up feature for feature against AutoCAD, the two come out roughly equal. However, DynaCADD is far superior in its handling of 3-D entities, and far faster in redrawing screens. The biggest difference between the two, vocabulary aside, lies in the way they handle the commands and the processing to attain similar results. This is neither positive or negative: both programs do much the same, but often approach the same concept from different viewpoints. It takes some getting used to the differences and the manual—the weakest element in the package—fails to help the user over them (see below). With a little perseverance, the professional who understands the basics of CAD can figure out how to achieve with DynaCADD what he or she can do with AutoCAD. If you're not steeped in preconceptions from using AutoCAD, then learning DynaCADD will prove a trifle easier. DynaCADD also reads AutoCAD's DXF files and can display everything in them except the text and (of course) the color information. We had no difficulty porting DXF files between the ST and PC. However, the loss of text from PC DXF files is disconcerting, especially if important information is contained in the text. It would be nice to offer a utility to translate AutoCAD fonts over to DynaCADD so the text could be imported as well. AutoCAD supports on-screen color definition. This is important for identifying layers and entities, something DynaCADD lacks, since it works in monochrome only (although you can print in color, if your printer or plotter supports it). AutoCAD lists for about four times the price of DynaCADD: $2,850 for version 9. If you consider the cost of a high-resolution color graphics system, based on at least an 80286 system, the hardware costs are another $10,000. Given this, DynaCADD compares more than favorably to AutoCAD as far as price for power. If Atari ever manages to make inroads into the business world, DynaCADD might go head-to-head with AutoCAD for market share. If the PC/MS-DOS systems are oranges to the ST's apples, then the Macintosh is another system of the same breed. 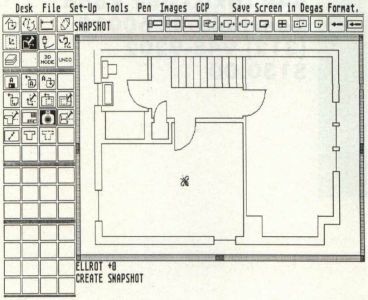 Right now, the best CAD package on the Mac is MGMStation, at $495 similar to AutoCAD version 9, but it only supports 56 layers, compared to DynaCADD's 256. It also doesn't have a macro capability and falls short on the isometric displays. VersaCAD should have released its Mac version by now, but initial press releases say it only supports 2-D. Despite the hullabaloo about the Macintosh, nothing currently available for Apple's frontline computer can match DynaCADD for features. ST users can rejoice in their superiority. The 300+ page manual is the weakest part of the DynaCADD package. It was written by the programmer, Dave Fletcher, and edited by the company's president, Nathan Potechin. It's admirable that they tried so hard, but they failed to provide documentation equal to either the program or the price being asked for it. It has a terribly inadequate index, gives no command examples, has far too few illustrations and the descriptions are obscure, often to the point of opacity, when explaining complex commands. What illustrations are available are not accompanied by the commands used to create the results. Figuring out how to get something equivalent is often very confusing. The order of the chapters is sometimes confusing and not conducive to clarity. The tutorials (2-D and 3-D) are mistakenly placed at the end of the manual (they should be at the front), but they are meager and sparse. Very little help is given to the user in either of the tutorials. Many areas of the program are poorly documented or even ignored, especially since the manual was written for an earlier version with fewer features than are currently available. The language is acceptable but generally poor, mostly using the passive voice and a spartan style that fails to explain things properly. A complete rewrite should be undertaken. At $695, the buyer deserves much better in a manual. Installation is easy and painless. You can suspend DynaCadd or save it and return to that same drawing later. There are many information commands which provide considerable information about the system and the drawing. There are a high number of complex commands, with much flexibility and control over drawings. There is a large, context-sensitive Help system, although the writing leaves something to be desired. However, the help is comprehensive and is almost a second manual in itself. Good upgrade policy, on-going program development and ISD appears to be willing to listen to the users and incorporate their requests and suggestions into the program. All commands are available through the keyboard (but see below about the space bar). Commands can be concatenated and stored as macros. The screen can be saved as a DEGAS format picture file, although the menu pad, menu bar, etc., are also included. There is no way to save just the drawing screen. There is considerable support for plotters and laser printers, including the Atari SLM804. However, only Epson 9- and-24 pin or compatible dot-matrix printers are supported. Drawings can be saved to disk as GEM image files. There is easy switching between viewing windows. The screen display is crisp, clear and distinct. Filter (not in AutoCAD) permits simple selection of particular types of entity for manipulation or viewing. For example, you can alter only circles in a drawing. ISD is very open to suggestion and listens to its users. They will incorporate suggestions and ideas, where possible in upgrades. 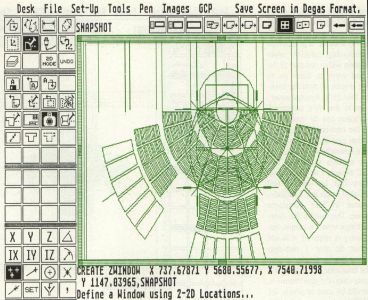 When you load the program, you must "activate" a part or drawing first. In order to load a new drawing, you must exit the program to the desktop, load DynaCADD again and activate a new drawing and/or part. You can't close a drawing and start a new one from within the program. This is incredibly annoying and no reason is given for it in the manual. You activate a command by pressing the space bar, rather than Return. This is hard to remember, since it does not follow. The program is not entirely bug-free. Transform (offset) locations, for example, seems to be at the computer's arbitrary choice, rather than where the user determines. The program sometimes crashes, although, to be fair, not very often. The cursor is hard to see and sometimes hard to position. It would be better if a small square surrounded the crosshair or if DynaCADD used a variable cursor to identify function or zoom mode. DXF files lose their text when imported. However, when DynaCADD reads a DXF file with text, it still takes time to process the text vectors, even though it ignores the text in the drawing later. Dealing with the missing text is slow. Printing is slow, but by most CAD standards, it's not excessively slow. There should be a printer driver construction utility for non-Epson printers. Monochrome is the only resolution supported. It is difficult or impossible to visually distinguish layers without color information. It can't detect intersections between a circle or arc and a straight line (it does easily with straight lines). AutoCAD allows you to select the intersection, not the lines involved. It doesn't support the mini/mainframe IGES file format. It should have a file conversion utility, since this format is supported by all major PC/MS-DOS CAD programs. There is no freehand sketch feature nor are there any fill patterns or cross-hatching. Undo only goes back one step, rather than backing step by step. It should be able to step backwards. The manual is mediocre, at best (see above). Many of the prompts and alerts are cryptic and none are explained in the manual. It's too easy to destroy or delete a drawing because the alerts don't explain the severity of the commands. There is no "crossing" command (to select any entity the window crosses) as there is in AutoCAD.